Every Mac comes with Apple's very own killer email client. It's called Mail, and in our opinion, it's one of the greatest applications ever. Thanks to Mail, you don't have to check each of your separate email accounts online anymore. Just pop them all into Apple's Mail and you can read all of your messages in one simple application. Apple's iCal is one of the best applications you can use to keep track of events, appointments, meetings, classes, and other everything else scheduling. But when you're away from your Mac, how are you supposed to find out what you have lined up for the day? If you use iCal's publish to web feature, you can simply visit your website for the latest and most up-to-date version of your calendar. Does your online banking website or other service refuse to log you in when using Safari? Believe it or not, a lot of these sites are still optimized for Internet Explorer and not other browsers. You can complain to the IT departments, and some websites are compatible with Firefox, but if you are committed to Safari there is an option. If you're new to Macs, or if you're not all that savvy with tech stuff (like creating websites and backing up important information with an online service), you should look into Apple's .Mac service. It's a $100 per year service that unlocks a number of cool features built into your Mac. 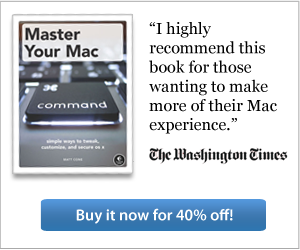 In fact, some of the features are so cool that even seasoned Mac users spring for it. Do you have a Gmail account? Do you know that Google's free email service works with Apple's Mail client? It does, and it's pretty nifty! Using Gmail with Mail.app means that you won't have to use Google's website to send and receive email messages, and you won't have to look at those pesky text advertisements Google displays next to your messages. Have you ever wanted to stream music to all of the computers in your house? Have you ever wanted to be a DJ? Have you ever wanted to create an online radio station full of music licensed under the Creative Commons, or music you create yourself? This tutorial will explain how to create your very own Internet radio station with Rouge Amoeba's Nicecast. Wouldn't it be nice to email files directly from your desktop, without having to go to your email client, create a new email message, attach the file, and then send it? With this new interactive tutorial, there's finally a way! We show you how to do it with both AppleScript and Automator. Just click here to launch the interactive tutorial. Several weeks ago, we showed you how to turn your Mac into a web server. That article is useful for individuals needing to host web pages on their Mac in a pinch, but it doesn't really go far enough. After all, any good web server should be remotely accessible - that is, you should be able to add and remove files from your Mac when you're away from home. Mac OS X is built on Darwin -- a Unix-like, open source operating system developed by Apple and built on FreeBSD. This means that Mac users have access to free built-in server applications, like the Apache web server. With Apache and the DynDNS service, you can turn your Mac into a powerful web server. Anyone will be able to access the website stored on your Mac!